Yesterday the jazz world lost one its last great bop masters with the passing of alto saxophonist Frank Morgan. Just shy of 74, Morgan had one of the more remarkable up and down and up careers in music. An acolyte of Charlie Parker, Morgan took hero worship to its extreme, emulating Bird in every way possible, including self-destructive heroin addiction. Having shown considerable talent early on, Morgan spent the better part of three decades in an out of addiction and incarceration, reemerging in the mid-80s with the fire and artistry promised years earlier. Over his last 20 years, he recorded prolifically, overcoming a major stroke in 1996 with yet another amazing comeback. In the past five years, he toured extensively, released an acclaimed three-CD series on High Note, "Live at Jazz Standard,” and capped it all with one of the sweetest studio recordings of the year, Reflections (technically released in 2006). On the bandstand, talking with the audience, Frank Morgan was a gentle soul who was quick to explain, “It’s great to be alive.” His soft-spoken manner belied the power of his horn, which could sting, cry, bite, burn or caress. He moved back to his native Minneapolis about two years ago, but his ongoing touring schedule never waned and we only had a few opportunities to hear him play in the Twin Cities. Yet through those moments we had a chance to see Frank at his most engaging and most humble. He initiated a series of sax/piano duos, beginning with a performance with Ronnie Matthews at the Dakota in 2005, with long-time collaborator George Cables at the Artists Quarter in 2006, and with Joanne Brackeen back at the Dakota in early 2007. At each gig, Frank played host as much as sax, often putting his pianist in the spotlight as soloist, simply delighted in the opportunity to present a favorite artist. But it was the interaction between Frank and his cohort that truly captured his talent. I just turned on KFAI (FM 90.3). Bill Kottman is playing the music of Frank Morgan this morning. Totally sweet. 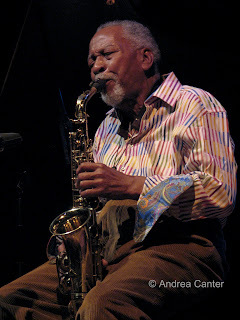 Photo: Frank Morgan on stage at the Dakota in early 2007. (Photo by Andrea Canter). See Jazz Police obituary at http://www.jazzpolice.com/content/view/7452/79/. And if you are in the Twin Cities, pay tribute to Frank at a memorial set for Sunday, December 23rd at the Artists Quarter in St. Paul, 3 pm.